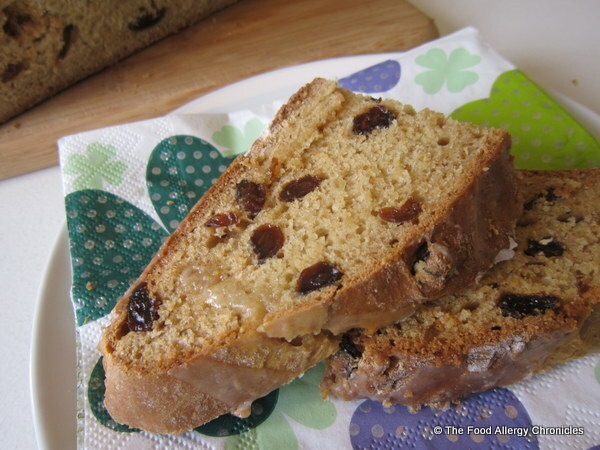 Posted on March 15, 2013 by Susan H.
St. Patrick’s Day is this weekend…what better excuse to bake an allergy friendly version of Raisin Irish Soda Bread. Next time, I will have to remember to drizzle the orange juice icing when the bread has cooled completely…it might not have drizzled right off the loaf! I followed the directions from my Canadian Living Cooks Step by Step cookbook. It is a variation of their Irish Soda Bread. Click here for the original recipe and follow the directions for the variation…Honey Apricot Irish Soda Bread. Substitute Natur-a Soy Beverage or Natur-a Rice Beverage mixed with 1 1/2 tbsp of white vinegar for the buttermilk. I also used all raisins instead of using apricots. The boys came in after a game of road hockey…sliced while still warm…the boys tried a slice of Dairy, Egg, Soy and Peanut/Tree Nut Free Raisin Irish Soda Bread. Quick and easy to make and bake…just in time for St. Patrick’s Day! P.S. Guess what? Our family ‘stepped out of the box last night’…enjoyed a night out at a restaurant! Post coming for Monday! Have you ‘stepped out of your box’ lately? 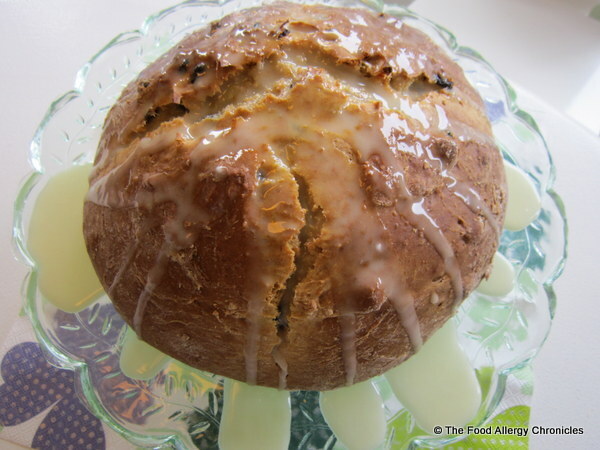 This entry was posted in allergies, baking, breads, breakfast, dairy free, multiple food allergies, peanut/tree nut free, soy free and tagged Canadian Living Cooks Step by Step cookbook, Dairy Soy and Peanut/Tree Nut Free Raisin Irish Soda Bread, Natur-a Rice Beverage, Natur-a Soy Beverage by Susan H.. Bookmark the permalink.